The Telecom Regulatory Authority of India (Trai) today released the monthly subscriber data for the month of September 2017. Like in recent times, Reliance Jio topped the chart once more by adding 5.9 million subscribers. At the end of September 2017, the subscriber base of Reliance Jio stood at 138.6 million, and it’s getting better with every month. 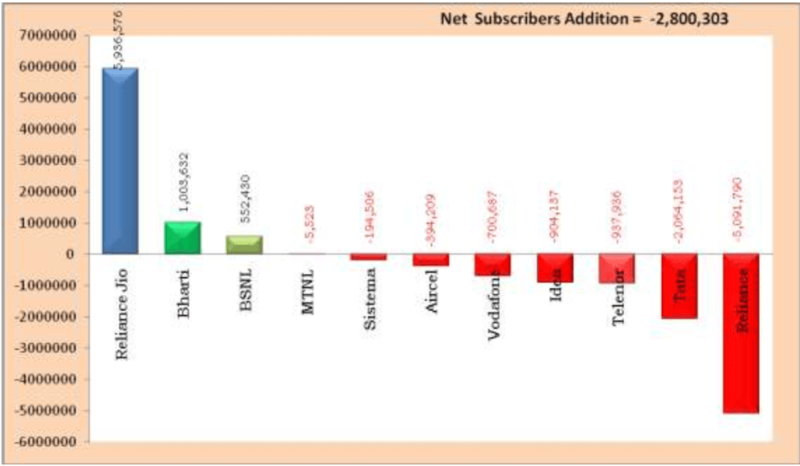 Out of the private telecom operators, only Bharti Airtel managed to add close to 1 million subscribers, and other operators such as Vodafone, Idea Cellular, Telenor, Aircel etc. lost subscribers by a considerable margin. Vodafone lost 7 lakh subscribers, Idea Cellular lost 9 lakh customers, while Aircel and Telenor lost 3 lakh and 9 lakh subscribers respectively. State-run telecom operator, BSNL managed to add over 5 lakh, new customers, whereas another government-owned PSU MTNL lost 5,000 subscribers. Sadly, at the end of September 2017, the total wireless subscribers (GSM, CDMA & LTE) declined from 1,185.84 million at the end of August 2017 to 1,183.04 million at the end of September 2017, thereby registering a monthly growth rate of -0.24%. The Wireless subscription in urban areas declined from 687.14 million at the end of August 2017 to 684.77 million at the end of September 2017, and wireless subscription in rural areas also declined from 498.70 million to 498.28 million during the same period. The monthly growth rates of urban and rural wireless subscription were -0.35% and -0.08% respectively. 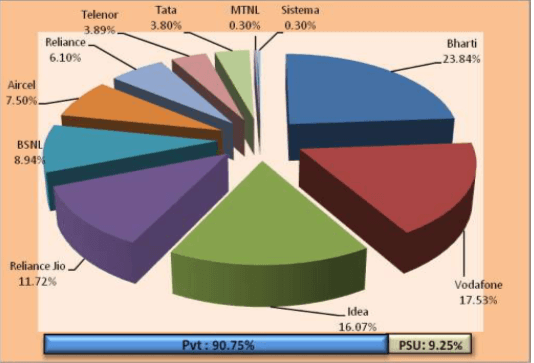 As on September 30, 2017, the private network service providers held 90.75% market share of the wireless subscribers whereas BSNL and MTNL, the two PSU access service providers, had a market share of only 9.25%. Out of the total wireless subscribers of 1,183.04 million, only 1,017.79 million wireless subscribers were active on the date of peak VLR in the month of September 2017 as per the Trai report. The proportion of active wireless subscribers was approximately 86.03% of the total wireless subscriber base. 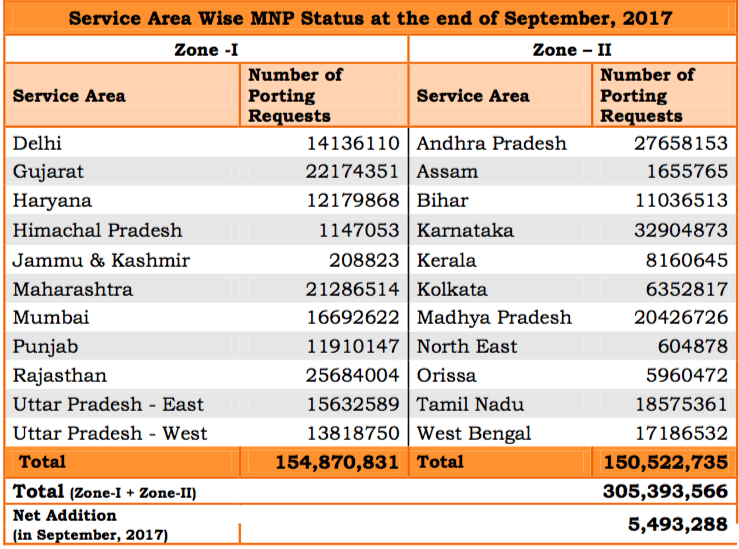 During the month of September 2017, a total of 5.49 million requests were received for MNP. With this, the cumulative MNP requests increased from 299.90 million at the end of August 2017 to 305.39 million at the end of September 2017, since the implementation of MNP back in 2010. It is noted that during September 2017, the cumulative figure of a number of requests for Mobile Number Portability has been crossed the 300 million mark since the implementation of MNP. This number is about 25% of total wireless subscribers in the country. Jio is looking at numbers differently by focusing on ARPU per month. They are not aggressive in chasing subscription unless you are giving them higher ARPU. Jio has minimum ARPU of 153 minus taxes for each user, and all recharges of 509 plan raises that number. AVOID must simplify their tariff plans and lessen the plan on offer if they want customers to spend more. Jio is changing the way this game is played and AVOID are still clueless how to respond. Amazon freezes the Amazon Pay Balance in case they find out one person is creating multiple accounts to avail cashbacks. In that case you will only be allowed to withdraw. Try creating a third account.